"Is there not something deep in our hearts that longs to draw nearer to God, to be more like Him in our daily walk, to feel His presence with us constantly? If so, then the Book of Mormon will help us do so more than any other book. 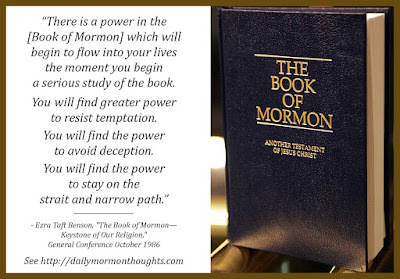 "It is not just that the Book of Mormon teaches us truth, though it indeed does that. It is not just that the Book of Mormon bears testimony of Christ, though it indeed does that, too. But there is something more. "There is a power in the book which will begin to flow into your lives the moment you begin a serious study of the book. You will find greater power to resist temptation. You will find the power to avoid deception. You will find the power to stay on the strait and narrow path. "The scriptures are called 'the words of life' (D&C 84:85), and nowhere is that more true than it is of the Book of Mormon. When you begin to hunger and thirst after those words, you will find life in greater and greater abundance." 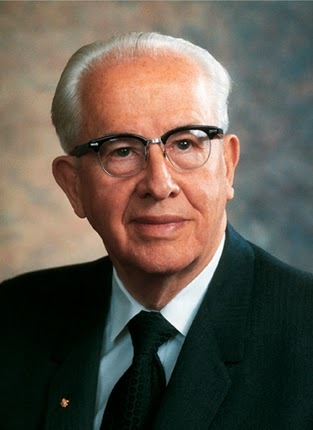 President Benson had a deep love and appreciation for the Book of Mormon. This was one of the key sermons, early in his presidency, when he shared the challenge to the Church to take better advantage of the gift that book represents. His witness builds upon Joseph Smith's statement that "a man would get nearer to God by abiding by its precepts, than by any other book” (History of the Church, 4:461). President Benson's testimony is that through the Book of Mormon, we can begin "to draw nearer to God, to be more like Him in our daily walk, to feel His presence with us constantly." What a blessing that is, and all we have to do is begin to "feast on the word"! The act of "serious study" will bring such strength and power to us. It will result in finding "life in greater and greater abundance." Why would we not claim those blessings? It's been over 30 years since that invitation was given, and the truth of it still rings loudly. We have only to act in order to claim the reward.